Let Patients Help, Cost-Cutting Edition, part 1: a bill. I often hear about how patients are a major part of the cost problem – their “non-compliance,” their wanting everything they can get, wanting it for free, etc. So, let’s see what happens when a patient who wants to help cut costs gives it a try. I was recently scheduled for a semi-annual test, four years after my treatment ended. I thought, “Hm, could I save costs by getting it somewhere else? Perhaps even find a place with higher quality? Get more for less? That’s what consumers like to do.” It turns out that information isn’t readily available. Next time I’ll hunt, but this was in the middle of my busy travel season. What was done to me? Which line items were mistakenly overcharged, if any? Which items were listed (and billed) without having actually been done? (That would be insurance fraud.) The insurance company wasn’t there, so I’m in a much better position to audit. All in all, did I get a good deal, for my $1,736 out-of-pocket co-pay? And did my insurance company get a good deal? Because when my $10,000 deductible is used up this year, they start paying. The accuracy question isn’t just academic; in 2009 I blogged at some length about significant errors in my billing records, such as conditions I never had. I’ll be glad to help reduce costs, and clean up my medical record, if the information is taken out from under the blankets. Any more of you lazy consumers out there wanna sign a pledge to do the same? Hi Dave, I love that you are doing this — scrutinizing EOBs to protect my family’s and employer’s pocketbooks is a special interest of mine, going back to the years when my son had lots of medical encounters. Sometimes it would seem like no one could really explain the EOB, as though it were some rune dropped from space. Can’t wait to find out what happens when you call! I thought I was the only “scrooge” in healthcare! Of course, it is our duty to scrutinize healthcare bills, both when they are covered by insurance or when we pay out of pocket. My first such exercise dates back to 1996 when my mother was hospitalized in one of the leading private(and expensive you bet!) hospitals in Athens. As costs were soaring, I asked the Accounting Dept. to give me the weekly hospitalization costs. In private hospitals they charge EVERYTHING! even paper towels and straws to sip tea!So, after checking the first week’s bill in which I found that my mother was charged X-rays, blood tests, disposables, etc. she had not taken (we were at her bedside all day so we knew exactly which procedures were made to her), I started shouting! The following week I kept a record of whatever was done to her and of all disposables+drugs brought, I cross-checked to the weekly bill I found again charged items that we had not made use of!! So, definitely shop around not better healthcare services at reasonable prices and check carefully your hospital bills, surprises may lurk around! I went back to your 2009 post and it all makes sense now. In the older post, you complained that the codes that you downloaded led to erroneous conclusions when you created you personal health record, so to avoid problems like that they eliminated all the codes in your bill–so now you have no information to understand what happened. But you have to thank them for the 34% discount that they gave you for your PPO plan membership. No, actually, they just stopped treating billing codes as a reasonable proxy for clinical reality. And I’m still legally entitled to a copy of my billing records. It’s just that now, with this high deductible insurance plan, I’m paying more attention, which is as it should be! And I may have more rights to demand answers and clarity. We’ll see. I was kidding about the notion that you got too many codes in the 2009 download to the PHR so they took the codes away in your bills. 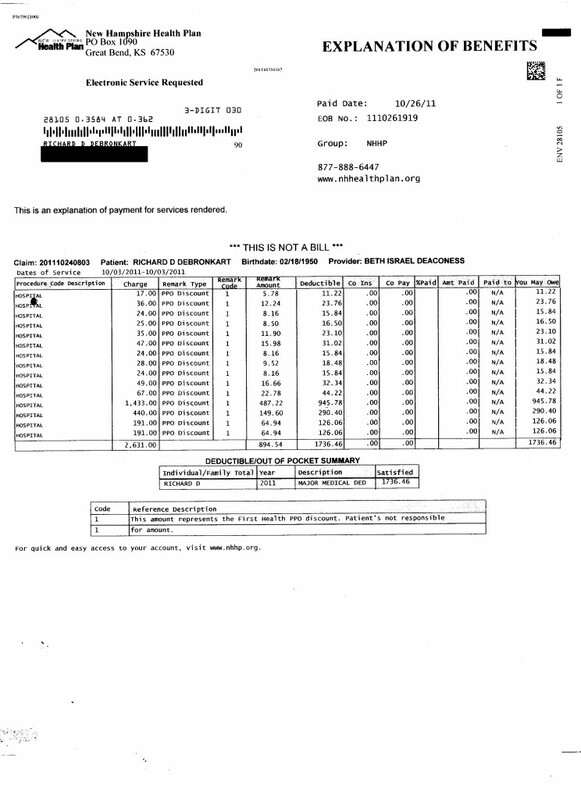 But it is interesting to try and reconstruct what this bill was without the CPT codes: the $1433 was the study, the $440 was the interpretation of the study (or possibly the room charge for the same day procedure), the smaller charges at the beginning were for supplies or possibly medications delivered such as an antibiotic or IV setup, etc. prior to the procedure. The $191×2 looks like what you would see for preparation and analysis of 2 path specimens. As more uninsured patients become self-pay, and more middle-income patients pay high deductibles (like me), perhaps we can bring normal consumer rights policies to this world. Let’s go back to your statement at the top that you passed by quickly – trying to compare costs ahead of time. You noted that info is not readily available. If you really want to have some fun next time you need medical care, push them a little on this. You will find out that it isn’t just “not readily available”, they actually don’t know. They charge different prices depending on a number of factors, and even then don’t know what they will be paid. To REALLY have fun, try to get them to give you a quote and promise in writing to commit to it – that will completely blow their mind. And yet in any other business on earth you would be able to go to the vendor and say “how much is that”, they would tell you, you would agree to pay, and the deal would be done. Well, now I really DO wonder if ordinary consumer protection laws will start to apply. I’ll gladly sign a pledge! The same has happened to me and my family again and again. Everyone needs to take part in improving our medical system and this means patients taking an active part in reviewing each EOB we receive and making sure that our insurance carriers are only being billed for services we received. I agree with you, too, that we (patients) should shop around for good prices for quality care. That’s how the rest of our economy works. It’s time everyone hold providers to the same standards of honesty and integrity when it comes to billing for their products and services. Boy, is THIS interesting! David Harlow, attorney and policy chair for the Society for Participatory Medicine (@HealthBlawg), just tweeted me about Simplee, which was demonstrated at the big Health 2.0 conference in San Francisco last month. You let it link to your health plan (insurance) etc, and it organizes everything into a slick (and intelligible) dashboard. Watch the quick demo video at bottom right of the page. Looks fascinating. Oh, foo and poo: it doesn’t yet handle my high-risk insurance plan (NHHP.org). Probably doesn’t matter, though, for purposes of clarity, because all it does is log in to the site using my login, which still merely identifies every line item as “HOSPITAL,” same as on the form they sent me. So, Simplee looks great, but it’s no use to me. Fudge. Thanks for giving Simplee a try and talking about us on Twitter! Health 2.0 was a great opportunity to talk about our solution. Sorry that we do not cover your health insurance yet. I will add it to our docket. We are adding new payors every month. Currently, we cover approximately 70% of all Americans. With Simplee, you can clearly understand and track your medical bills. Just as your wrote, EOBs and medical bills are difficult to understand even for healthcare wonks! As well, Simplee checks every bill that comes through our system with your plan. If there is a bill that is not in-line with your plan, we will send you an email and alert you to the error. In fact, I just received an email informing me that he saved several hundred dollars because Simplee alerted him that his insurance did not cover his bill correctly. So I called the hospital, and they’re sending me line item detail, in a week or so. They said it’s not available online, so I guess that means Simplee won’t be able to access it – right Simplee? Interesting. Note: every single item might be kosher – we have no reason to think otherwise. It’s just awfully hard to check. I come from the typesetting industry. Imagine what books would be like if it were this hard to proofread. Hi there, Beth from Simplee. Yes, right now we can only pull in what we get from the insurance company. We do clean things up if we have the data to do so, but if either the provider or the insurance company provide a very generic bill there’s a limit to what we can do. I’m sorry we’re not covering your provider, because this kind of frustrating thing is exactly why we started. Actually, we just did a “Clarity of Bill” analysis internally to examine which companies tend to have more detailed vs. generic bills– some payers are definitely way better at this than others. I remember my husband getting a bill and calling the hospital to tell them that he had been a CPA for 40 years and could make no sense of this bill. Currently we are dealing with a hospital that cannot get their billing straight and over bill. I suspect that many seniors just pay the bill to stay away from a collection agency. And the healthcare agencies keep building more buildings and outpatient clinics – many look like Taj Mahals. I guess this billing technique is how they plan to pay for them. And, Linda, the more we go self-pay (uninsured or high deductible), the more I imagine we’ll start demanding to know what the hell we’re being billed for, and refusing stupid things. That would be good. So I asked if they cover it. Great news: yes, as of 1/1/2011, this plan covers vaccines 100%! Then I asked if they have information on which providers have the best price. Answer: no clue; the tone suggested the lady found it odd that I’d be asking. And it probably is odd! But what the heck, why SHOULDN’T consumers (patients) try to help hold costs down?? Hooray! We witness the birth of a bill-e-patient! Won’t it just scare the crap out of them if we all start asking “What’s this? ?” AND, because we’re paying out of pocket, start demanding ordinary consumer protections? btw, all, I just discovered Rachel’s blog, and it’s a keeper. I gotta say, Cake Health has a major branding problem – one gets no idea at all what they do. At least with Simplee’s name you get a hint. Anyway I’m about to post a comment about the detail that did arrive from the hospital. Stay tuned. Well, you rang my bell for this one. It is tiring and frustrating to try to correct erroneous claims on EOB’s when they give you no intelligible information. For one hospital visit I was charged $695.75 for IV drugs that were wrongly coded as pharmaceuticals that I left the hospital with. It took a year and a half of calling both the insurance company and the hospital to correct that one. I was charged for a prostate exam by a proctologist, and do you think the EOB would give me any identifying information? It’s maddening. They tell us to be wise consumers, but we can’t even call the pharmacy to get an accurate price on a prescription. How are we supposed to shop through their vale of secrecy? Notice what’s happening here, people: employers have the volume to attract better decision tools. In my speaking last fall I saw over and over that the category most interest in improving *now* is self-insured employers. Apparently Microsoft’s insurer is acting in a way that’s consistent with that goal, too. Didn’t I hear somewhere of a regulation (in some industry) that the best tools to enable improvement have to be made available to “the lowest of the low,” as the Biblical saying goes? It could be a radically powerful way to bypass whatever is the source of our intractible cost increases. Dave – a challenge is that if you get tests done at the cheapest place, the results may not be easily available to your doctor. And in some cases (e.g., MRIs), the doc may not trust the quality of the study. So repetition and frustration happens because of these situations. The way we have been trying to solve this is through health information exchange. Instead, we should make us, the e-patients, the providers of health data about us through our personal health records. Thanks for the thoughtful note, Joe – sorry for the delay – somehow my comment notifications have been failing lately. > a challenge is that if you get tests done at the cheapest place, the results may not be easily available to your doctor. I’m well aware of that. As you mention below, the solution IMO is to fix that. I’m not saying it’s easy – my whole point on this blog, time after time, is that the system we have today, with all its miracles (including saving me), has gigantic closed doors and speed bumps that truly get in the way of fixing the system, and I’m tired of it…. When I got my A1c tested last year, both in the doc’s office and at a retail lab near home (for comparision), how ironic is it that I got the retail results faster than the docs got theirs? >And in some cases (e.g., MRIs), the doc may not trust the quality of the study. I know, and I imagine that might be valid in some cases. In other cases it’s pure BS – I’ll soon be blogging about a major northeast cancer center that marks ALL incoming MRIs “poor quality – do over.” Corruption IMO. > we should make us, the e-patients, the providers of health data about us through our personal health records. Absolutely! See Lucien Engelen’s “Here is my data” initiative in the Netherlands. Agree! You sound like a member of our Society for Participatory Medicine – are you? ?